However, it was time to relent and cook with it – with and for - my vegan daughters. And had no regrets, for everyone, including me enjoyed it. I even managed to eat a piece or two – of tofu! Wrap the tofu brick in thick tissue paper and place it between two chopping boards weighed down for half an hour. Once it has been pressed completely, cut the brick into cubes. Heat a tablespoon of oil in a pan and shallow fry the tofu cubes on high flame for a few minutes. In the same pan, add three tablespoons of oil and add the sliced onion, green chillies, chopped tomatoes and cashews. Sauté the ingredients till the onions are browned and the tomatoes are cooked soft. Allow the mixture to cool and grind into a paste in a grinder. In the same pan, heat the remaining oil and add the bay leaves and let it fry till it turns aromatic. Add garlic – ginger paste and sauté. Next add the Kashmiri chili powder, turmeric, coriander powder, cumin powder and the Kitchen King masala and mix well. Pour the prepared onion and tomato paste and let it cook until the oil begins to separate. Add salt and sugar and some water to the gravy and add the frozen green peas and the fried tofu cubes. Let it come to a boil and lower the heat. Simmer for about 5-6 minutes. In the meantime, place a piece of charcoal until it burns red-hot. Once it is done place the hot charcoal in a small steel bowl lined with some aluminum foil. Place the steel container with the live coal on the matar paneer and pour ¼ tsp of oil on the charcoal and cover the pan to trap the smoke from the charcoal for about a minute. Remove the steel bowl carefully. 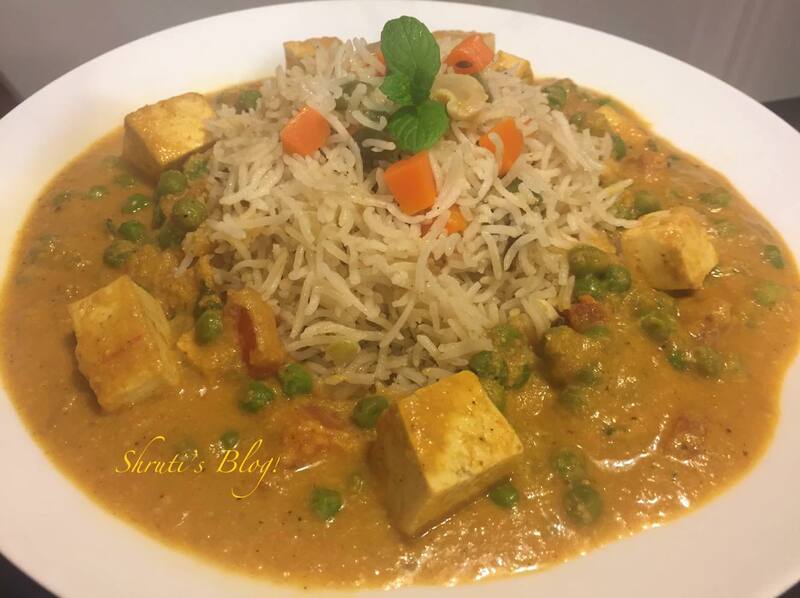 Finish the matar paneer gravy by adding the garam masala and garnishing with chopped coriander. Serve with a simple pulao or rotis. When you have managed to bring your eyebrows down, let me tell you this is indeed apropos perfectly edible kabab, and no, I haven’t gone the Bill Gates way -consuming things purified from waste. “Kachra” in this case refers to leftovers that almost made it to the bin, but were brought forward in a new avatar. That still hasn’t cleared the polemic around my dish, for a vegetarian kabab is a contradiction in terms. Aren’t kababs supposed to be these corpulent, hedonistic parcels of pure indulgence? The food of the rich and the royal, young and old… legend even has it that the ageing and toothless foodie Nawab Wajid Ali Shah of Lucknow had instigated the creation of the Galauti Kabab to pander his passion for meat. I am not qualified at all to talk about these meaty matters, nor do I intend or dare to, but am wrong to imagine that a lot of the epicurean charm of kababs comes from their exotic names? 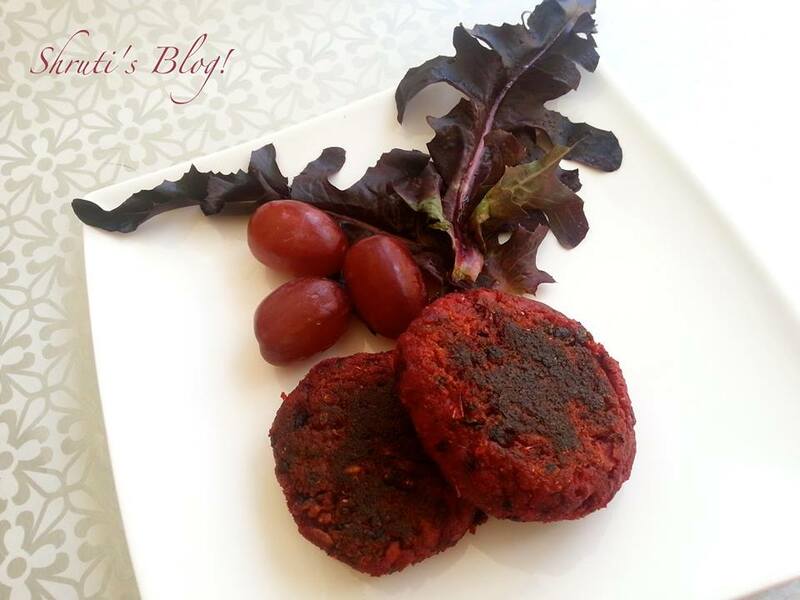 Tunde ke kabab, chapli kabab, reshmi kabab – names like these only pique one’s interest. So why not call this kachrey ke kabab? Or better and more exotic still, “Galti ke kabab”, where galti is a testimony to the grand mistake or apology of a kabab! After all, it’s only ghaas-phoos eating vegetarians like us who not only dare to think of a vegetarian kabab, but even have the audacity to think of making one out of left over roast vegetables and give the dish a fancy name and fancier presentation! Place all ingredients except the oil and chana daal powder, into a food processor and blitz it. Check and adjust all the tastes and flavours and then add the roasted chana daal powder to make the mixture firm. Divide the mixture into uniform sized balls and flatten them. Heat oil in a pan and shallow fry the kebabs until golden brown on both sides. Serve hot with chutney, tomato ketchup and a salad. This post was written nearly three and a half years ago - but never made it to the blog - So this makes it a leftover post brought forward! Do read her post on her blog Strewn Ashes! मी (आस्ट्रेलिया हुन मैत्रिणीला फोन वर) - तुला माहित आहे - आमच्या दारात घोळ आहे ! मैत्रीण - त्यात काय नवल ! तो तर तुमच्या कडे नेहेमीच असतो. मी - अगं - तुझा समजण्यात घोळ होतोय - घोळाची भाजी उगवतीय आमच्या अंगणात. टोमणा समजून देखील मी खुलासा करते. आणि तुमच्या मनात अजून घोळ होण्याआधी तुम्हालाही सांगते - मी म्हणते तो घोळ म्हणजे भाजीचा आणि मैत्रीण म्हणते तो म्हणीतला. पण आता त्यावरून वाद-विवाद झाला तर खूपच घोळ होईल हो. Ghol, or purslane (kulfa in Hindi) is a wonderful and tasty little plant packed full of goodness. It contains more omega 3 fatty acids than any other plant source. It also contains vitamins A, B, C and E as well as calcium, magnesium, iron and potassium. The pigments in the leaves and one in the yellow blossoms have been proven anti-mutagenic or anti-carcinogenic. As a mild diuretic, it is known to lower blood pressure as well. All this comes for about 15 calories per 100 grams! 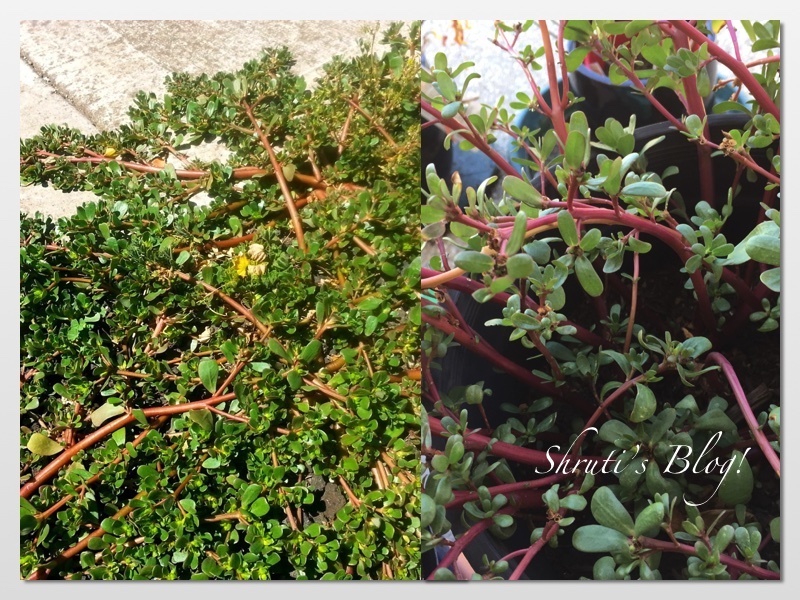 Purslane is widespread globally and is a common summer-growing plant on most continents. The ancient Persians and Indians and even Indigenous Australians have used this wonder vegetable, in salads or cooked as stir frys or bhajis. In Australia, purslane is considered as a weed, and grows wildly, in gardens, wasteland or ungrazed areas, and even in the cracks of pavements. However, I believe it deserves to be recognised as an ancient and highly nutritious super food source and grown specifically for food. I have tried to collect the seeds and grow the plants from seed, but haven’t succeeded in the past. This summer, I have dug up shoots and transplanted them in a pot, so we can have plenty of gholachi bhaji, koshimbir and varan! 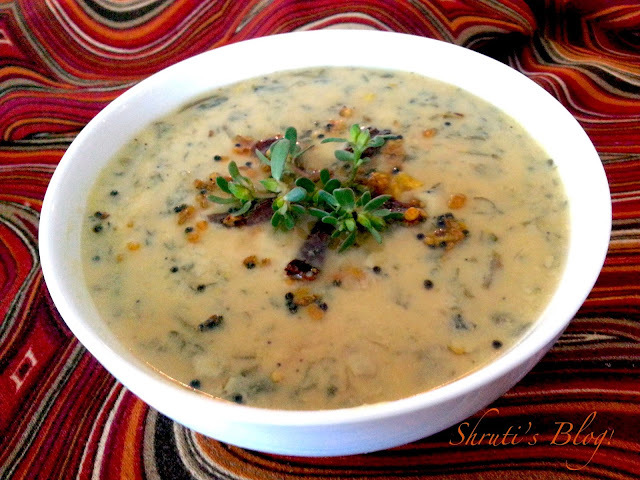 Mix the buttermilk or diluted yoghurt, chopped purslane, boiled peanuts, chopped chillies in a pot or pan and heat. As it starts simmering, add the besan and atta / rice flour paste and stir continuously. This amount of cooking is enough for the purslane/kulfa. The mixture will start to thicken. Add the salt and sugar and adjust the taste and also the consistency. Add water if necessary and according to taste. Let it come to a rolling boil and then remove from heat. In a small pan heat the oil and add the urad dal. Just as it starts to become pink, add the mustard seeds and then the cumin seeds. When the seeds start to splutter add the chopped garlic and curry leaves, then the hing, methi powder, pinch of turmeric. Take care not to burn the tadka. Switch off the heat and pour the tadka on the takatli bhaji. It will sizzle, but settle down. Cover the takatli bhaji for a while to allow the flavours to infuse. Serve hot with rice or jowar bhakari with some pickle.